Today I'll be discussing pancreatic cancer risk factors, causes, and symptoms. On August 16th, 2018, the world lost the 18 Grammy Award Winning, Gospel-inspired, piano playing, iconic songstress, Aretha Franklin. She was called to glory after a hard-fought battle with pancreatic cancer. Pancreatic Cancer Risk Factors, Causes, and Symptoms. Ever since the queen of soul passed, I have been asked a lot of questions about pancreatic cancer. What are the symptoms of pancreatic cancer? How do you know if you have pancreatic cancer? Should you be screened? I'm going to tell you all about pancreatic cancer in this article. Pancreatic cancer is the fourth leading cause of cancer-related deaths in the United States. The pancreas is the organ that sits in the central upper abdomen, is located right behind the stomach organ. The pancreas is about six to eight inches long and about two inches wide. It extends from the head of the pancreas, which is on the right side of the abdomen, connected to the small intestine, near the gallbladder and the liver. The pancreas extends to the tail of the pancreas, which is more on the left side of the abdomen. The pancreas is the organ that's responsible for producing certain hormones such as insulin, which regulates your blood sugar. The pancreas also produces certain digestive enzymes or digestive juices, which help us to digest fat. There are two types of pancreatic cancer. One, which comes from the endocrine glands or the hormone-producing cells such as an insulinoma. The other type of pancreatic cancer comes from the exocrine glands or from the pancreatic ducts, and this exocrine gland pancreatic cancer is the most common type of pancreatic cancer. What are the symptoms of pancreatic cancer? One is weight loss. 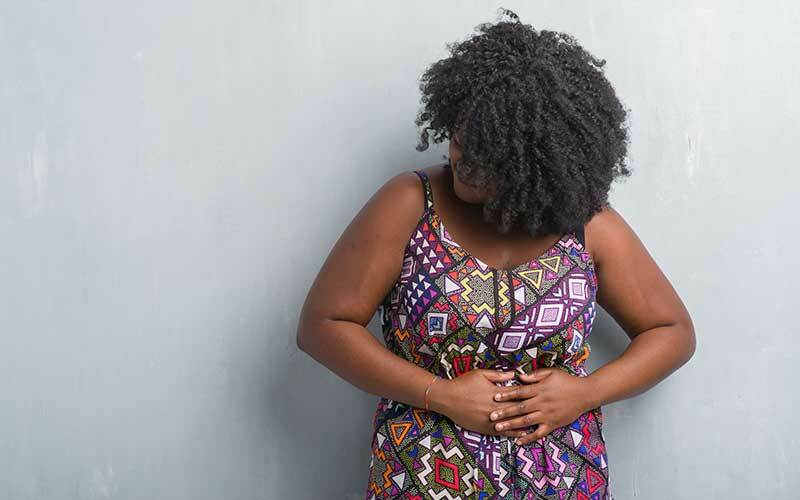 Patients with pancreatic cancer often have early satiety, meaning they get full quickly off of just small amounts of food, or they may just lose their appetites altogether. Another symptom, abdominal pain. Patients often have a dull, aching abdominal pain in the central upper abdomen, and it often radiates to the back. Another one of the pancreatic cancer risk factors or symptoms is jaundice. Jaundice occurs when a patient's skin turns yellow or the whites of the eyes turn yellow, and this is due to a blockage of the flow of bile by pancreatic cancer. Patients who have jaundice, this yellow skin, will often also have a change in their stools. The stools will look really fatty and greasy, and they'll float and even be pale colored. This is due to a lack of proper digestive enzymes, which are normally produced by the pancreas. Sometimes, patients with pancreatic cancer, won't have these symptoms at all until very late or never. 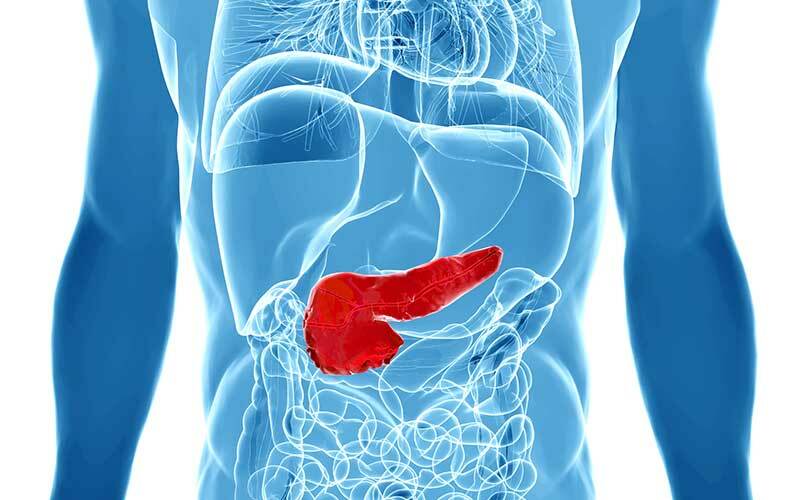 Patients who have pancreatic cancer at the head of the pancreas will typically show symptoms early on and at least have a better chance of the cancer being detected earlier. Why? Because when the pancreatic cancer is at the head of the pancreas, it can block the small intestine and block the flow of bile. It can block things which will cause pain, cause the weight loss, cause jaundice, and allow the patient and the physician to know that something's going on. For patients who have cancer that's way off at the tail of the pancreas, oftentimes their symptoms don't present until the cancer has already spread. So, patients who have cancer at the head of the pancreas will tend to present earlier and have a better chance of being treated earlier. How can you be diagnosed with pancreatic cancer? If you have any of the symptoms I described, it is important that you consult your physician as soon as possible. Your physician will do a complete history and physical, and they will likely do some imaging studies such as an ultrasound of the pancreas or a CT, computed tomography of the pancreas or a test called an ERCP, endoscopic retrograde cholangiopancreatography. If they are suspicious or if they see a mass that looks like pancreatic cancer, then they may do a biopsy, which is when they have a physician to take a small sample of the mass, and a pathologist is another type of physician who will look at that sample and determine if it is or if it isn't pancreatic cancer. There are four stages of pancreatic cancer. Stage one is when the cancer is caught before it has had a chance to spread to any other organs, and the stages progress all the way to stage four when the cancer has already spread to other organs when it's metastatic. The treatment for pancreatic cancer really depends on the staging. If the cancer is caught early, there's a chance that you can have surgery or surgical removal of the cancer. Patients will often have an adjuvant therapy, which means they will receive chemotherapy and/or radiation, especially if the pancreatic cancer has spread. In cases of stage four or metastatic pancreatic cancer, a lot of those patients will also receive chemotherapy. However, that chemotherapy is usually just to shrink the tumor or to help to decrease the symptoms of the tumor. Stage four pancreatic cancer is usually not curable. So what are the pancreatic cancer risk factors? Well, five to 10 percent of patients who have pancreatic cancer also have family members with pancreatic cancer. So, we do believe that there is some hereditary component. Other things that have been associated with pancreatic cancer include cigarette smoking, obesity, physical inactivity, and the Helicobacter pylori infection. But quite honestly, we really don't always know the cause of pancreatic cancer. This ends my overview of pancreatic cancer risk factors, causes, and symptoms. I want you to take care of yourselves, and if you have any of the symptoms that I described, please consult your physician immediately. Those symptoms are weight loss, abdominal pain, and jaundice. Also, make sure that you prioritize yourself. Take care of you. As always, strive to live your healthiest, happiest life.